Musicians visit schools and introduce pupils to classical music. 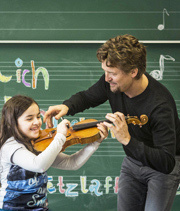 This is the idea behind "Rhapsody in School", a project that has not only captured the imagination of a group of renowned soloists such as Christian Tetzlaff, whom you can see in the photo, but also of schoolchildren. We have gladly supported this project for several years and do so with a great deal of conviction, which is why we are giving them a Christmas gift.